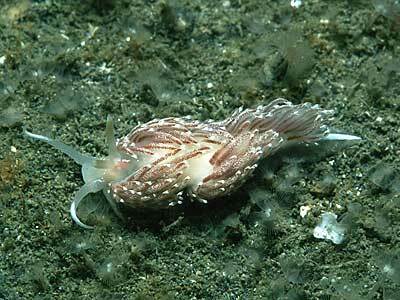 Description: When fully grown this nudibranch may reach 38mm in length. The ground colour is translucent white and there is a rose coloured hue around the mouth. The animal's red oesophagus is visible, just behind the rhinophores. 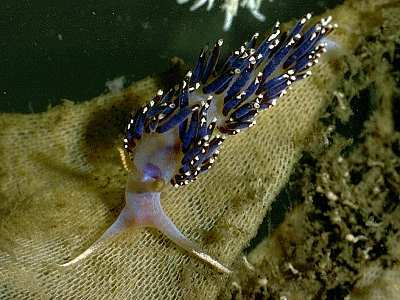 There is an iridescent blue sheen on the head and ceratal surfaces that is characteristic of the species, but better developed in animals from deeper water. The oral tentacles are very long and the rhinophores are annulate. There are streaks of white pigment on both sets of tentacles. The cerata are also streaked with white, as is the tail of the animal. Habitat: Known to feed on several hydroid species, but has mainly been found on Obelia geniculata on kelp fronds and on Tubularia. Found under boulders on shore as well as in the sublittoral. Distribution: Recorded from all around the British Isles and from Norway to the Mediterranean. Propodial tentacles, long oral tentacles and annulate rhinophores present. Foot narrow, cerata short, in distinct bunches, long narrow tail. Cerata with red digestive gland and iridescent blue surface colour. Picton, B.E. & Morrow, C.C. (2016). Facelina auriculata (O F Müller, 1776). [In] Encyclopedia of Marine Life of Britain and Ireland.